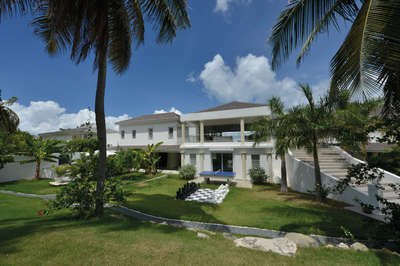 Villa Interlude is an elegant five bedroom, located on Baie Rouge Beach offering gorgeous views of the ocean. This fully air conditioned villa offers a spacious living room with an 75" TV with Blu ray player and a Bang Olufsen sound system. The gourmet kitchen leads to the comfortable dining areas overlooking the covered terrace and expansive pool deck. The master bedroom and the three main bedrooms feature king size beds, air conditioning, TV and en suite bathroom with showers. The fifth smaller bedroom has twin beds, air conditioning, TV and a small bathroom. This bedroom is located in a wooden bungalow, a few steps away from the main house (recommended for teenagers, young adults or staff).